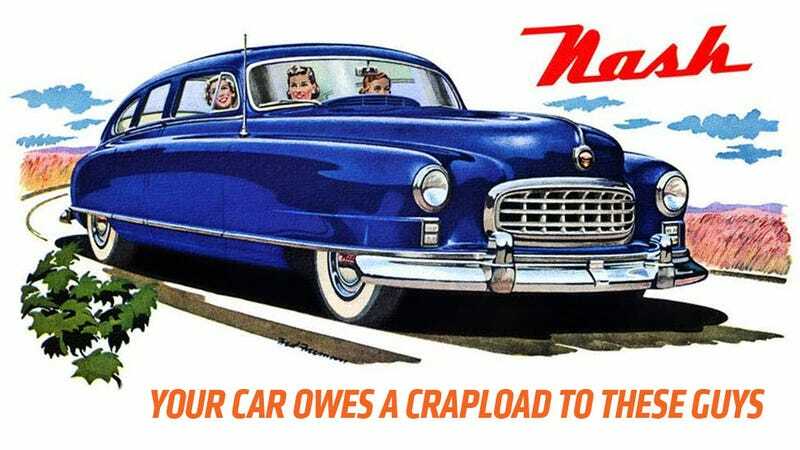 Nash Motors would have been a century old today, and while I suspect that most modern gearheads probably don’t give Nash much thought, they really should. For a defunct car company, we still feel Nash’s influence a surprising amount, in ways that are pretty basic and fundamental to how cars are today. Let’s pretend we’re all old dudes in bad shirts at a car show and take a bit to appreciate the crap out of Nash, in six huge ways. Nash wasn’t the absolute first to come up with a unibody car design – that honor probably goes to the 1922 Lancia Lambda. Nash was the first to really build a full-unibody car in an affordable car in real volume: the Nash 600. Unibody cars dispense with a separate frame and as a result are far lighter, more efficient, and, if you’ll look around, by far the most popular way to build mass-market cars today. Sure, a few others did it first, but Nash was the first manufacturer to jump into unibody in a big way, paving the way for literally everybody else. Are you a fan of not dying of heatstroke in your car? Me too! It’s one of my favorite ways to not die. Same goes for not freezing to death in a car in the the winter. For these great ways to not die, you should probably be thanking Nash Motors, because it came up with the HVAC system that formed the basis of pretty much every one in use today. The process of getting to the integrated fresh air/heating/cooling system that Nash eventually called, creepily, Weather Eye came in a few discrete steps. First, Nash engineer Nils Eric Wahlberg created the idea of a flow-through ventilation system, the sort that is used on pretty much every car today. This was used in 1938 on the first car heater that took in fresh air and passed it over a heater core full of hot radiator water (again, how it’s still done), and then the next year added a thermostat to the system. This was the first Weather-Eye. Later, after Nash merged with Kelvinator, makers of refrigerators, Nash leveraged Kelvinator’s stone-cold cooling-skills to make the All-Weather Eye, the first modern-style heating/air-conditioning system for a car. Unlike previous systems that took up a good chunk of the trunk, the Nash Weather Eye was all under the front cowl, and, of course, formed the template used by every HVAC system today. Well, lap belts, at least. Volvo and those safety-loving Swedes introduced the modern 3-point harness in 1958, but nine years earlier, in 1949, Nash was offering lap belts as an option on their cars. Sure, they weren’t as effective as the later three-point belts, but they were a shitload better than nothing, and there’s a lot to be said for being the first manufacturer to offer anything like them at all. Nash was a pioneer in the subtle and beautiful art of sleeping in your car. Way back in 1936, it pioneered the ‘Bed-in-Car’ system, where the rear seat would fold down, creating an opening into the trunk, allowing you to sleep in the car, with your legs in the trunk. I tried this method in a BMW 2-Series, actually. This also may be the first example of a folding rear seat to get bigger things in the trunk, as well. Later, Nash moved to a new in-car-slumber system, in 1949, and by 1950 it’d refined it into something it called the “Nash Airliner Reclining Seats.” These are closer to how we understand them today, front seatbacks that can recline. The Airliner seats would recline flat, and would meet with the rear seats to form a nice long bed, all enclosed within the passenger compartment. I’m sure many in the Baby Boom era were boned into existence in such an arrangement. Okay, this one is pretty contested, but Nash can make a reasonable claim to have one of the first true muscle cars, the Rambler Rebel. Sure, many people may point to the 1950 Hudson Hornet as the Ur-muscle car, but it never came with a V8, which some purists claim is needed for true muscle car status. Also, Nash bought Hudson in 1954, so in some ways, it’d even have a claim if we went with the Hornet. The Rambler Rebel, though, really fit the formula: a small-ish, relatively light (thanks to unibody construction) body fitted with a huge V8 engine – in this case, AMC’s new 5.4 liter V8. The body was a four-door, but a pillarless hardtop-style, so it had a certain coupé-like appeal. At the time, it was the fastest stock sedan you could buy. That seems like a proto-muscle car to me. I don’t think I can credit Nash with the first American really compact car, since Crosley was building some seriously compact cars in America since 1939, but Nash was the first American company to build them in real quantity, and the way it built them presaged the modern, very international auto industry. Nash’s small car was the adorable Metropolitan, a tiny little shrunken big car with interchangeable door skins and a drivetrain from Britain: the Austin B-series engine. These little American cars with British mechanics were built by Austin in the UK and then shipped to the US. This sort of internationalization of auto-making is routine today, which is why we have those stickers on new cars to show just where the hell all the bits were made. You can thank Nash’s little clown car for the destruction of borders, automotive-ly. That’s a lot of pretty important firsts for a dead car company, and most of these highly influential things are all under the skin or behind the scenes. It’s easy to forget about Nash, but once you really start digging into how cars are built today, you see their fingerprints all over the place.